Your anniversary need not be just a single day to remember, but an occasion to celebrate all year round with one of our beautiful anniversary rings. 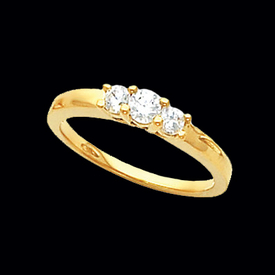 Every time your glittering anniversary ring catches your eye it will remind you of the one you love the most. Platinum Diamond anniversary band. This Diamond Platinum band holds 1/5ctw diamonds, nice simple band. Vibrant diamonds each measure 1.7mm round, they are SI 2 clarity, G-I color. Platinum 5 Stone Diamond Anniversary Band. 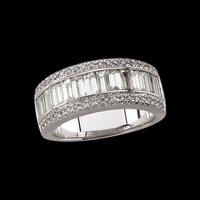 This Sophisticated Diamond Band is available in a 1 carat size. Diamonds are SI clarity G-I color. Available Very Nice Ring. Platinum diamond anniversary band. Lovely Platinum 1/2ct tw Diamond "S" design band. Each diamond measures 3mm round and weighs 1/10 carat. You will love this Beautiful Band. Stock size 6. Free ring sizing, custom sized items are non returnable. 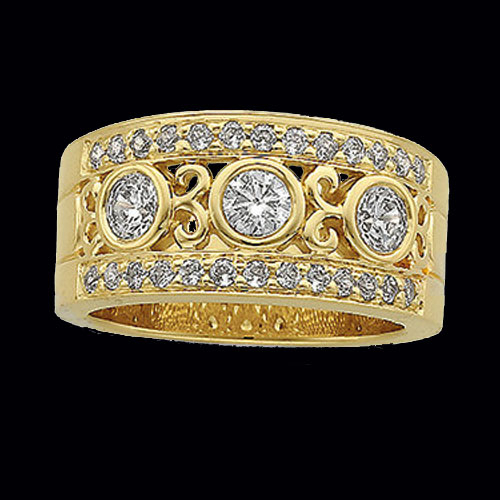 14K Gold Diamond Cluster Anniversary Band. Shown in 14K White Gold, also available in Yellow Gold. This Diamond Anniversary band has 5 clusters totaling 1/2ct tw. Fabulous 14K Gold Yellow or White 1/2ct tw Diamond Band. Wide diamond band weighs 7.9grams. Diamonds are SI 1-2 clarity G-I color. Lovely combination of round, princess, and baguette diamonds. Princess Cut 3 Stone Diamond Ring. Available in 14k Yellow or White Gold in a 5/8ct tw, and 9/10ct tw. Princess cut diamonds are SI 1 clarity G-I color, alot of sparkle and brilliance in this ring. Diamond 3 stone anniversary band. 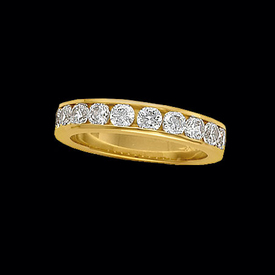 14K Yellow or White Gold, Also available in Platinum. Center Diamond is 1/2ct each side diamond is 1/4ct for a total of 1ct tw. Diamonds are SI 1 clarity G-I color in this fantastic classic ring. 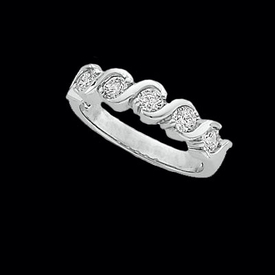 This Lovely 3 Stone Diamond Anniversary band is a popular choice. 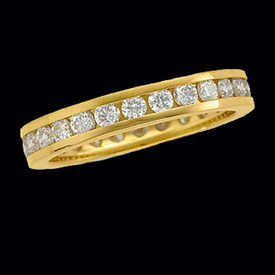 14K Yellow Gold or Platinum 1 1/4ctw Diamond Eternity Band Speaks louder then words. Sizes Available are 6,7, and 8. Platinum also available. Diamonds are SI2-I1 quality G-I color. Very classic diamond eternity band. 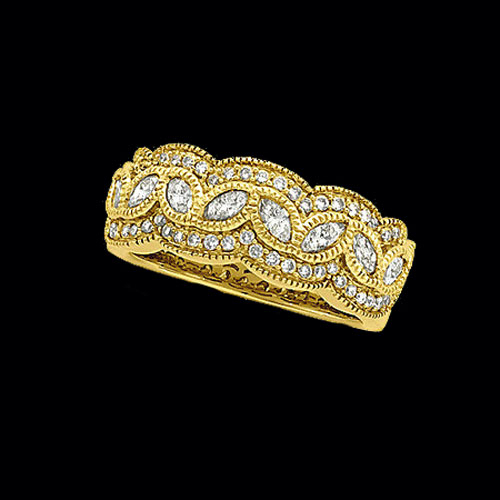 Gorgeous Antique Design 14k Gold Diamond anniversary band. Available in 14k Yellow gold, this diamond anniversary band holds 1ctw diamonds, marquise and rounds. Diamonds are SI 1-2 clarity, G-I color. Ring weighs 8.2 grams. Stock size 6-7. 14k White gold Sapphire and Diamond ring. Sapphires total aprox. 1/2ctw, diamonds are SI 1-2 H-I color and total 1/4ctw. 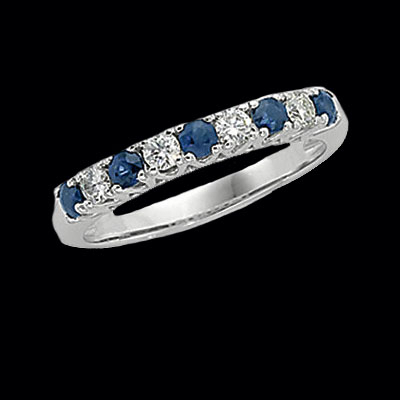 Very nice sapphire diamond anniversary band. Etruscan Inspired Anniversary Ring. Incredible 14k Yellow or white Gold Diamond Anniversary band. This ring holds 3 .20ct diamonds across the center bordered with 26 1.5mm accent diamonds, 1 ct tw. Simply Gorgeous. Diamonds are SI 1 clarity G-I color. Custom made to order item. Free sizing, add size to comment box at check out. Diamond Anniversary Band. Princess Cut, Baguette, and Round diamonds create this lovely Anniversary Band. Diamonds total 1 1/4 ct tw. Diamonds in this ring are SI 1 clarity G-I color. 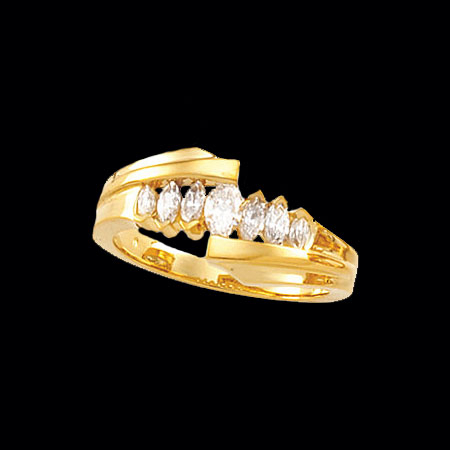 Available in 14k White or Yellow Gold. 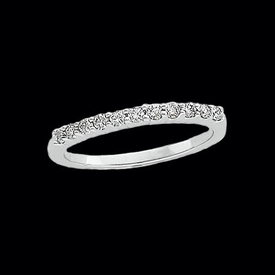 Diamond Anniversary Band 1ctw available in 14K Yellow or White Gold. Start a tradition with this lovely Anniversary band and add to it through out the years. Ring is set with 10 diamonds each .10ct or 3mm round. A wonderful anniversary band for your 10 year anniversary. Diamonds are SI 2 clarity G-I color. Fantastic band. 14K Two Tone Gold Princess Cut Diamond 5/8ct tw Anniversary Band. Diamonds are SI2 in clarity G-H in color. Very pretty ring. 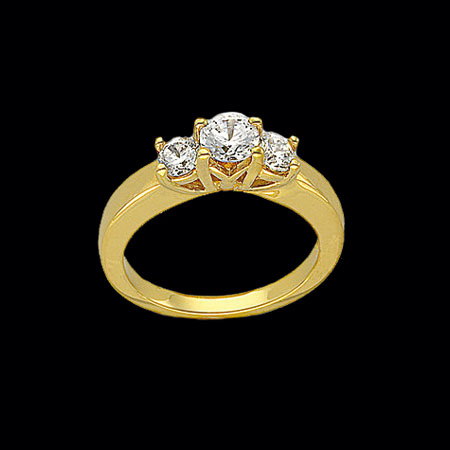 Exciting style 14k Gold Diamond Marquise anniversary band. Available in 14k Yellow or White gold and different carat weights including .63ctw, .75ctw, and a 1ctw selection. Custom made to order item. Curve Design Anniversary Band in 14K Gold. Diamonds total 1/3ctw in this delightful 3 stone diamond anniversary band. Custom order this ring design in 14k White gold or Platinum selections. Stock size 6-7. 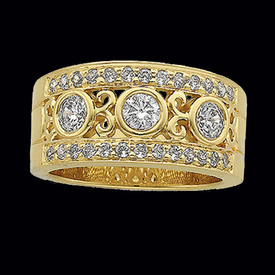 14k Gold Diamond 2ctw Anniversary band. 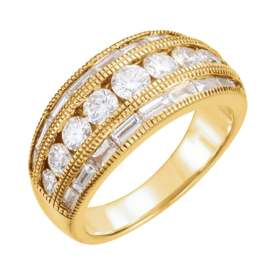 This wonderful ring is available in your choice 14k White or Yellow. Diamonds are SI 1-2 clarity and G-I color. Brilliant ring. Baguette diamonds border a round of round creating this lovely design. Ring weighs 8.80 grams. Platinum Princess 3 Stone Diamond Anniversary Band. This Platinum classic 3 stone ring is set with 2 .40 carat princess cut diamonds, one on either side of 1/2 carat center. The center diamond is not included but we have hundreds of perfect diamonds to choose from in our lloose diamond data base. Brilliant diamonds are SI 1 clarity G-I color. Incredible Platinum classic 3 stone anniversary ring.